This afternoon, I took my bicycle off the wall and set it on the ground in preparation for a ride over to the rock climbing gym. It was then that I experienced a sensation I haven’t had since purchasing and installing tubeless road wheels: a disturbingly soft, squirmy tire. Apparently, during my last bicycle ride I must had suffered a puncture that resulted in an overnight leak, but I figured no worries as I had Stan’s NoTubes sealant in the tires. I figured all I had to do was a quick air-up and spin of the wheels, and the puncture would be sealed and I’d be on my way without having to make a repair. So I pumped and pumped. Sure enough, sealant started squirting out of the tire hole, only to seal a few seconds later. 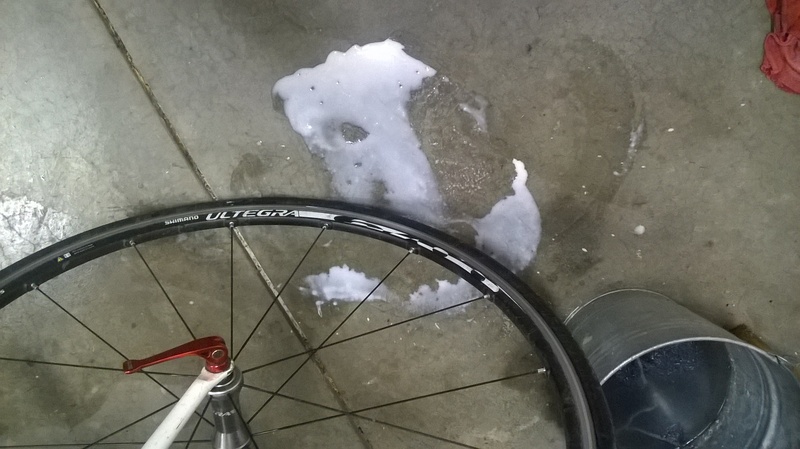 I put in more air and was ready to declare victory when the pressure burst through the sealant site and white latex sealant streamed onto the garage floor. The tire sealed again moments later, but when subsequently inflated above 60 PSI, sealant burst at the puncture again. Not good. Apparently, the puncture was larger than just a pinhole prick. Clearly, then, some sort of repair was necessary: either install a tube, or repair the cut. 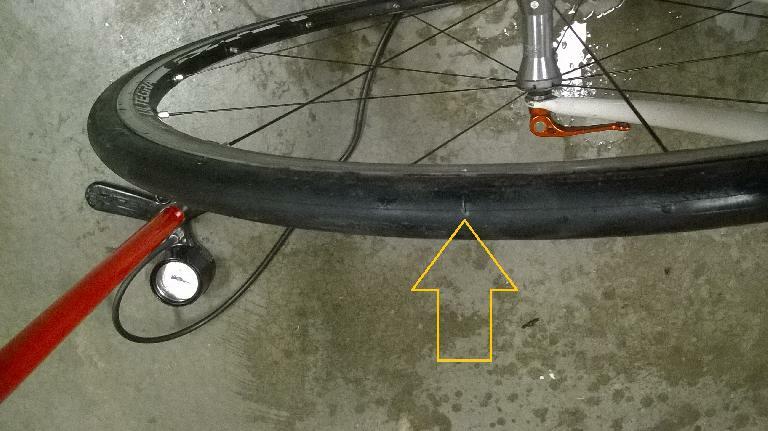 Never having repaired a tubeless tire before I was slightly apprehensive at first about the second option, but a quick perusal of relevant Internet articles allayed any misgivings. Find the puncture. This was super easy as the leaking sealant made the location obvious. With the wheel vertical, rotate the wheel so that the puncture is at the top. (Sealant will rest inside the tire at the bottom.) Removing the wheel from the bike is not necessary. Use tire levers to unseat the tire near the site of the puncture. Tubeless tires are definitely harder to remove than conventional ones, and having at least two tire levers was a necessity. Unseating the whole tire is not necessary; just at the affected location. Clean the inside of the tire at the afflicted area with acetone or rubbing alcohol, followed by sandpaper. Apply rubber cement on the inside of the tire around the puncture and wait for 30 seconds for it to become tacky, just like you would do for a bicycle tube. Apply a tire patch to the cement. Optional: add more tire sealant to the inside of the tire, especially if a lot of it had leaked out. Reseat the tire and inflate. The process was fairly easy. The repair must have been entirely successful too because in the ensuing weeks, the tire would hold air just as well as before the puncture. I rode 785.6 miles and for 59 hours, 44 minutes between April 14 and August 10 before having to do this flat repair. That is 118 days. I consider this quite good. It should be noted that after the first 206 miles, the rear tire did suffer a puncture while I was riding, but it sealed within five seconds with minimal loss of air and no need to apply a patch. 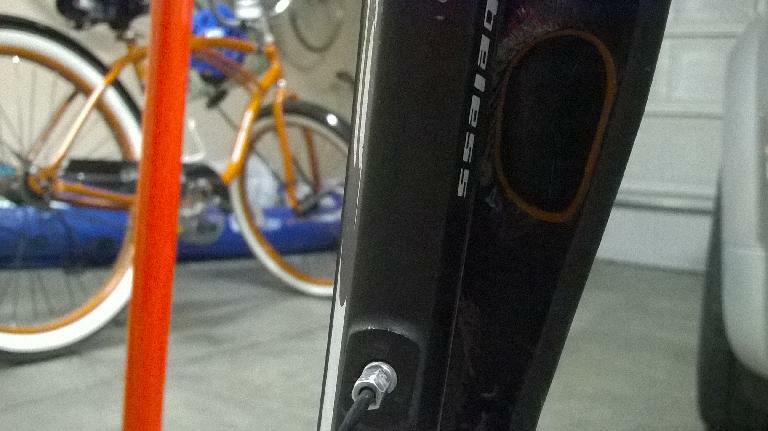 That alone pretty much sold me on tubeless road tires with sealant.